Interdisciplinary research is a rewarding enterprise, but there are inherent challenges, especially in current anthropological study. Anthropologists investigate questions concerning health, disease, and the life course in past and contemporary societies, necessitating interdisciplinary collaboration. Tackling these ‘big picture’ questions related to human health-states requires understanding and integrating social, historical, environmental, and biological contexts and uniting qualitative and quantitative data from divergent sources and technologies. The crucial interplay between new technologies and traditional approaches to anthropology necessitates innovative approaches that promote the emergence of new and alternate views. 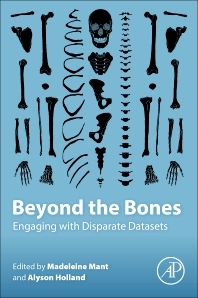 Beyond the Bones: Engaging with Disparate Datasets fills an emerging niche, providing a forum in which anthropology students and scholars wrestle with the fundamental possibilities and limitations in uniting multiple lines of evidence. This text demonstrates the importance of a multi-faceted approach to research design and data collection and provides concrete examples of research questions, designs, and results that are produced through the integration of different methods, providing guidance for future researchers and fostering the creation of constructive discourse. Contributions from various experts in the field highlight lines of evidence as varied as skeletal remains, cemetery reports, hospital records, digital radiographs, ancient DNA, clinical datasets, linguistic models, and nutritional interviews, including discussions of the problems, limitations, and benefits of drawing upon and comparing datasets, while illuminating the many ways in which anthropologists are using multiple data sources to unravel larger conceptual questions in anthropology. Examines how disparate datasets are combined using case studies from current research. Draws on multiple sub-disciplines of anthropological research to produce a holistic overview that speaks to anthropology as a discipline. Explores examples drawn from qualitative, quantitative, and mixed methods research to illustrate the breadth of anthropological work.